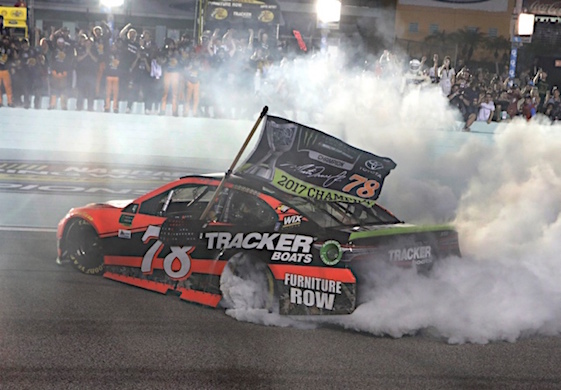 BRISTOL, Tenn. – Defending Monster Energy NASCAR Cup Series champion Martin Truex Jr. said Friday that sponsorship was the key to his remaining at Furniture Row Racing in 2019. 5-hour ENERGY, a co-primary sponsor on Truex’s Toyota with Bass Pro Shops/Tracker Boats for 30 Cup races this year, announced last month it was leaving the sport. Truex said that heading into the playoffs it’s important for team members to focus on their jobs and not become sidetracked by the sponsorship issue. Kevin Harvick said Friday that he doesn’t believe Stewart-Haas Racing’s switch from the Ford Fusion to the Mustang next year would be as difficult as the team’s move from Chevrolet to Ford two years ago. “I think we’ll be way ahead of where we were there because it wasn’t just changing the body before, it was taking on building your own chassis and starting your own complete engineering department and a lot of other things that came with what we did the first year (2017),” Harvick said. “It was just one problem after another (that first year). When we first went to Ford it was quite an undertaking. Kevin Harvick says the lifestyle that’s required to compete in NASCAR’s top three series is tougher now than preparing cars for the race track. “I like the off-week being a couple weeks before the Playoffs start because that’s really when it takes another step of intensity and you’ve got to be ready for that mentally,” Harvick says. However, Harvick admitted he didn’t know what his off-week plans entailed. “Keelan has to go to school, so that’s really the main priority. Everything will pretty much revolve around that and how that’s going,” Harvick explained. That’s primarily because there were some “unapproved Mom moments” during Keelan’s recent time with his father. A Quarter Midget was acquired and Keelan crashed a golf cart into a pine tree.